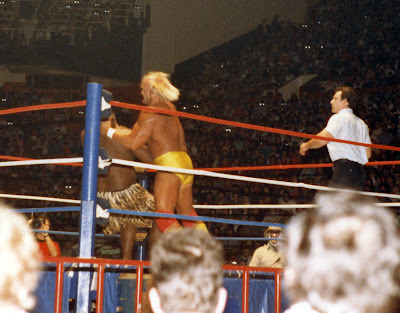 In the main event of the Toronto wrestling card at Maple Leaf Gardens, December 28, 1986, Kamala the Ugandan Headhunter faced WWF Champion Hulk Hogan in a no-disqualification title match. As I explained in a previous post, WWF booking had Hogan facing a series of monster heels in a predictable series of matches. It was no different from how The Original Sheik was booked at the Gardens in the 1970s. Match, no-DQ match, cage match. Maybe an odd other stipulation like a bunkhouse match to prevent the heel from running away and being counted out, or a strap match for the same reason. I was not a Hulk Hogan fan. Even in 1986, I preferred the speedy and agile Bret Hart or Dynamite Kid, or witty bad guys like Roddy Piper. Hulk's balding blond head, obscenely dark tan, greasy-sweaty body, overinflated muscles and growling patter just rubbed me the wrong way. The whole "saying your prayers" schtick sounded insincere to me. 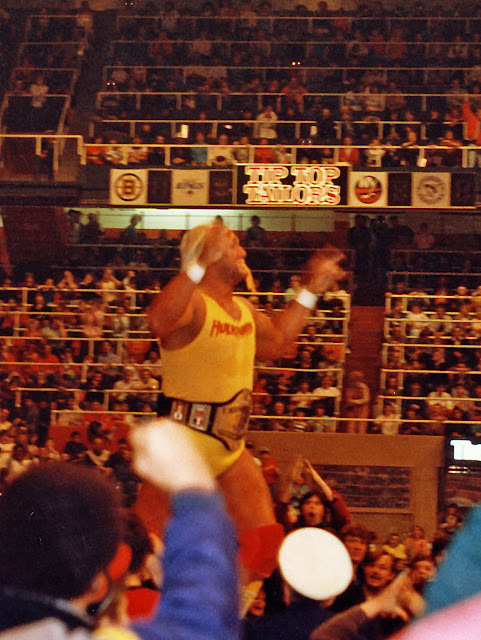 But there was no denying Toronto liked Hulk Hogan. They left the lights on when he walked up that famous MLG ramp on December 28, 1986.
at Maple Leaf Gardens in Toronto, December 28, 1986. This post is heavy on images. Click any of them for a bigger look, and check my Google+ or Flickr pages for a few more angles and 600dpi scans. and throwing it at Kamala. Referee John Bonello is admonishing Hulk, even in this no-DQ match. I came to the Gardens with a new hand-painted sign playing off Kamala's savage cannibal head-hunter gimmick. It had cut-out pictures of Hogan and Kamala with the line "HOW'S HOGAN TASTE?" No one could have seen my sign from the ring area, I'm sure. Hulkster sets a bad example by choking opponent Kamala in Toronto's old NWA ring at Maple Leaf Gardens. ... he unwrapped his wrist tape and choked poor Kamala with it. 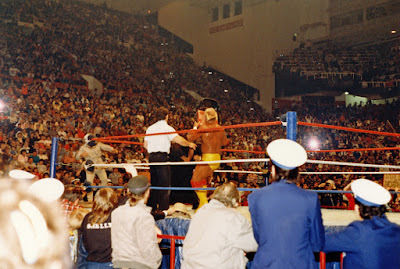 Kamala's manager, The Wizard, pleaded with referee John Bonello to intervene, but this was a no-disqualification match, so Bonello could only look angry, wave his arms, and count impotently. The sold-out Toronto audience cheered. I booed. I wanted Kamala to win! 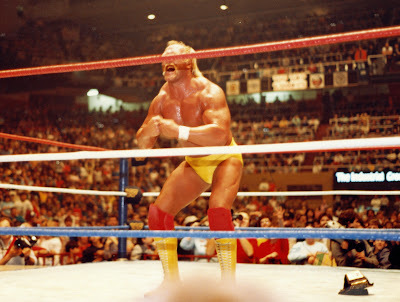 I wanted Kamala to make Hulk Hogan bleed! Soon, Kamala got the advantage and had Hulk on the ropes, winded and beaten. at Maple Leaf Gardens in Toronto, Ontario Canada in December 1986. Kamala pounded on the champ. He chopped and kicked, to the head, to the throat, to the back. Hulk pleaded to the crowd for inspiration. 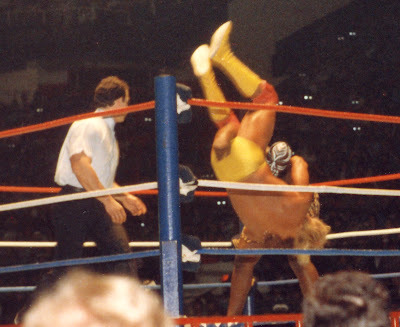 Kamala bodyslams Hulk Hogan in a no-DQ championship match at Canada's Maple Leaf Gardens, 1986-12-28. But then, Hulk stopped feeling pain. 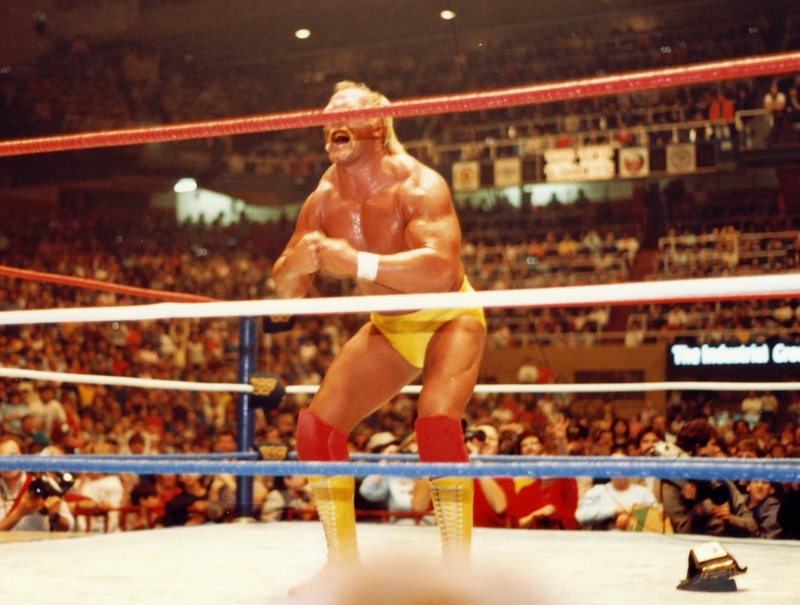 Kamala's blows just made Hogan shake. He stood and shook. He shook his fists. He shook and shook. Then he just stood still, with wide eyes. Kamala reeled back in fear as Hogan waved a finger in the Ugandan's face and prepared to deliver a clubbering. Then, Kamala's buddies jumped up. Kim Chee and The Wizard got Hulk's attention, and the champ ran out of the ring. He pursued them from corner to corner, past the timekeeper's table to the ramp and around the high red railings patrolled by the white-hatted Maple Leaf Gardens ushers. Referee Bonello counted ten. The bell rang. Hulk was counted out of the ring. OH MY GAWD. Did Kamala just win? Did I just see a title change? This was a no-disqualification match, right? Ding ding ding. The referee has a decision. "Your winner," said Marty, "as the result of a count-out ....... The Ugandan Headhunter, Kamala!" OH MY GAWD. KAMALA WINS THE TITLE. THIS IS AMAZING. HOGAN IS DONE. "But," said Marty. But what? But what? Give Kamala the belt! "Since the championship can only change hands by pinfall or submission, the World Wrestling Federation Champion remains......Hullllllk Hooooogannnn!" NO! That's .... what? What kind of rule is that? I've never heard of such a thing! What a rip-off! BOOOO. Boo, Hogan, BOO, you big fat phony. Maple Leaf Gardens folding chair as Kim Chee cowers on the Toronto ringside ramp. Not only was poor Kamala denied the title, Hulk continued his display of poor sportsmanship by cornering the challenger's elderly manager, The Wizard, and hitting him on the head with one of the ringside folding chairs as Kim Chee ran to the ring ramp for safety. The crowd went crazy as the arena lights stayed on and Rick Derringer's "Real American" blared over the PA system. Boo, you jerk. Toronto ringside fans stand on their chairs to see Hulk Hogan pose after losing. 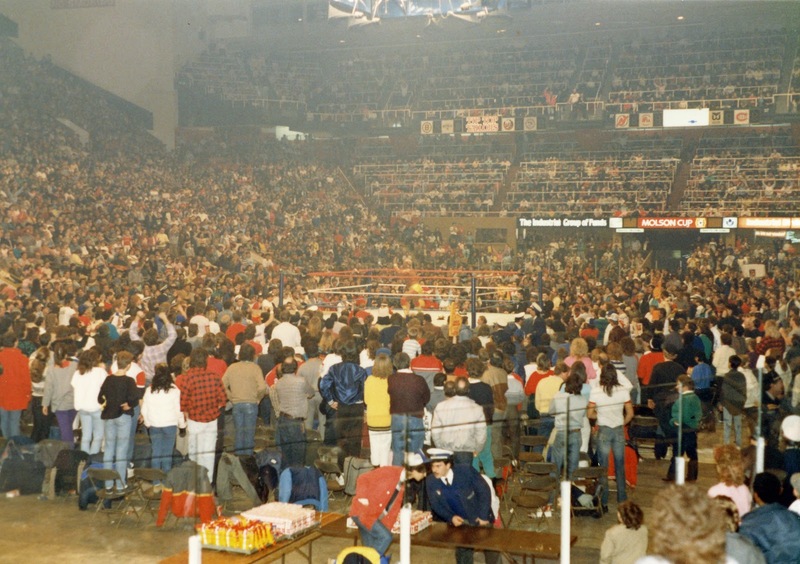 The lights stayed on and people remained on their feet -- some standing on their chairs -- as Hulk posed in the ring and encouraged the audience to cheer for him. In the photo above, you can see a MLG usher and popcorn vendor conversing, as if to say "what kind of crazy shenanigans is this? These people are nuts." demonstrates his 'most muscular' pose in his red and yellow outfit. Well. Obviously the only way to keep these two from getting disqualified or counted out is to put them in a cage and force them to battle in there. 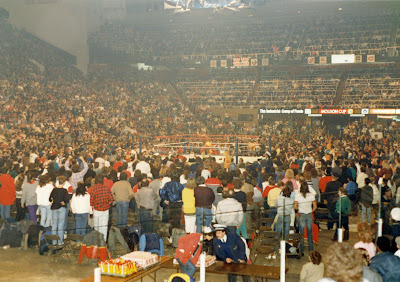 And wouldn't you know it.... after the intermission, ring announcer Marty told the audience that Promoter Jack Tunney had just signed matches for the next action-packed card in January. 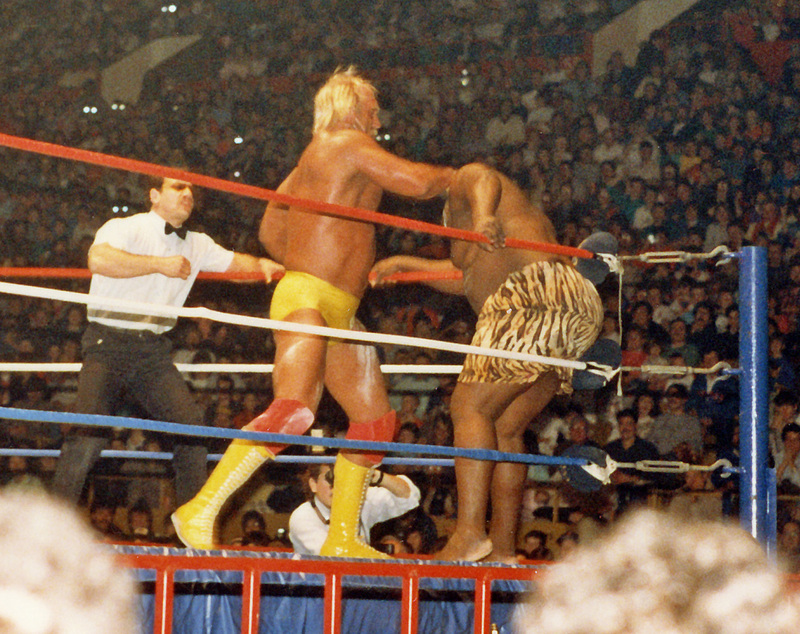 In the main event, World Wrestling Federation Champion Hulk Hogan would face Kamala....in a steel cage! I went home with a Rowdy Roddy Piper "Hot Rod" t-shirt, a WWF Program magazine, and these fantastic photos my dad captured. I think we went up the road for pizza. It was a great afternoon, even though Hulk Hogan won. 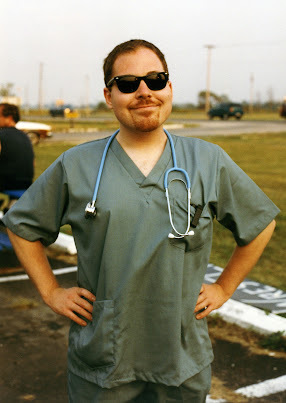 I'm really enjoying this blog. Given what I write about on my blog, a lot of your memories are my memories, too, just from Boston instead of Toronto. Hogan was indeed fed a steady stream of challengers during his first title run. I'm impressed that Curtis "The Wizard" Iaukea was actually at your house show. And what a crowd, judging by the photos. You rarely see crowds that big these days for house shows, unless it's MSG. Thanks, man. I'm sure my stories would echo those in Boston, Philly, NYC, LA, or any of the other cities WWF was running then. I haven't looked at the results site to confirm, but I bet everyone was running some version or another of the same gig. It's always neat to hear another person's perspective on the same events....even if it's just a different part of the country....or different part of the building. Really enjoying it too Scott , great stories and pics ! thanks for taking the time!